An user-friendly text analytics tool. It is used to extract insights from unstructured data in order to improve your marketing results. It has customer lifetime value feature, using which you can distinguish customers based on business value. Using this software, you can identify fraudulent activities and eradicate it. In addition, it provides quality assurance in order to resolve quality issues in early stage. By using it’s customer segmentation option, you can easily segregate and group your customers. Along with this, it has predictive maintenance using which you can predict equipment failure in early and can provide cost-effective maintenance. How much does RapidMiner cost ? 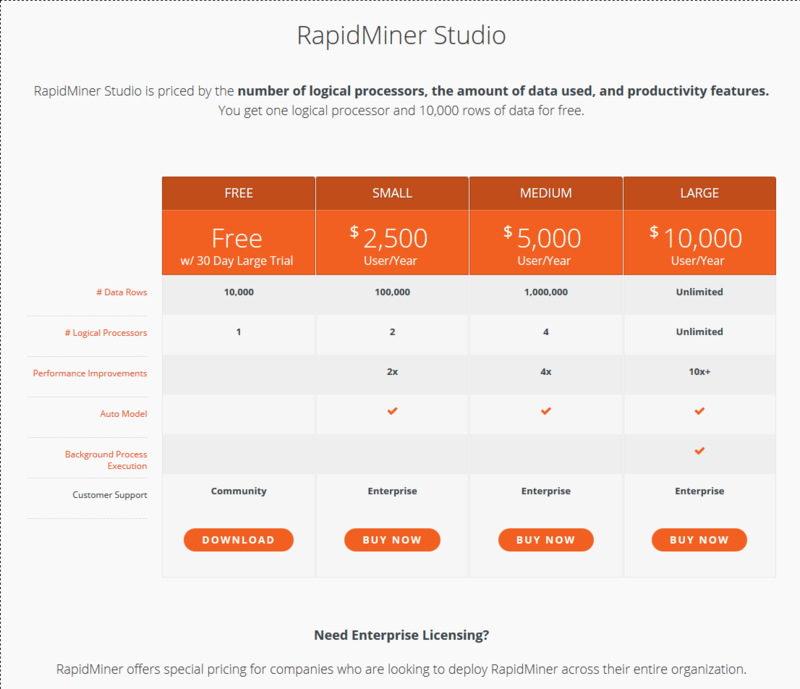 The pricing for RapidMiner starts at $2500.0 per user per year. 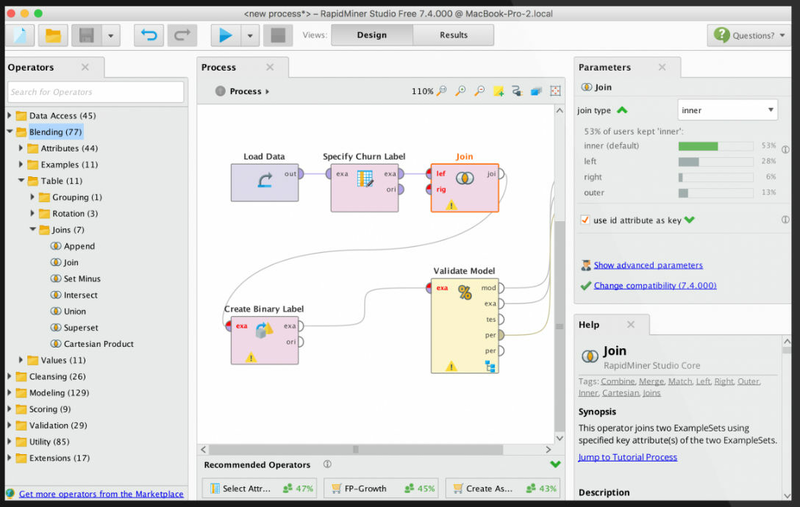 RapidMiner has 7 different plans such as - RapidMiner Studio Small at $2500.0 per user per year, RapidMiner Studio Medium at $5000.0 per user per year, RapidMiner Studio Large at $10000.0 per user per year, RapidMiner Server Small at $15000.0 per year and RapidMiner Radoop Enterprise at $15000.0 per year. RapidMiner Server Medium at $30000.0 per year and RapidMiner Server Large at $60000.0 per year. 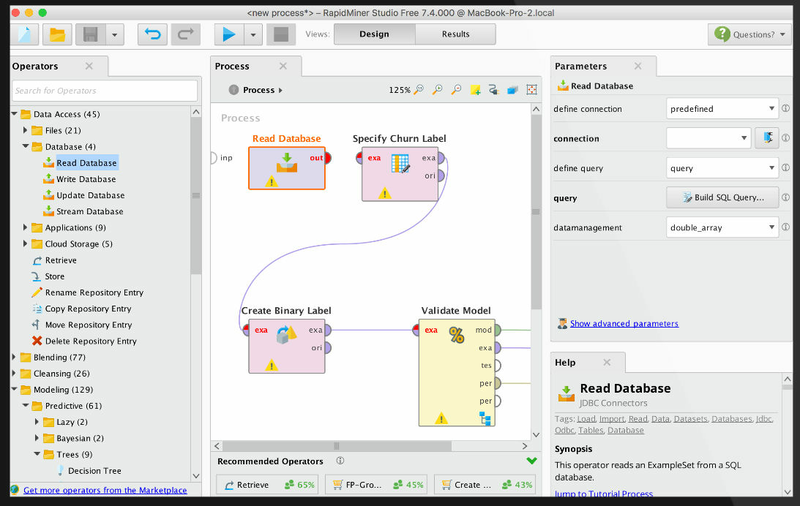 RapidMiner also offers a Free Plan with limited features. To get additional 10000 rows (up to 50000) in a free plan, referring a friend to RapidMiner or upgrade to RapidMiner Studio account. 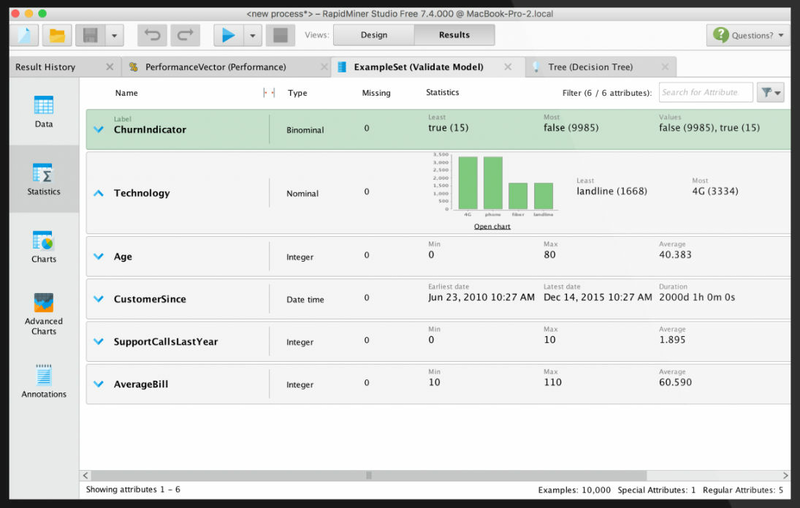 Pros: Visual workflow designer is the best part for predictive analytics. I really like drag n drop interface for generating models. Prebuilt templates are quite useful. Cons: It's not always free. You need to purchase it if you wana work with more than 10000 rows. Its processing becomes too slow (almost hangs) while working with terabyte or petabyte of data. Sometimes, it becomes difficult to handle hundreds of models available. Overall: It's a good platform while applying predictive analytics on any dataset with a user friendly interface to have the true picture of the future. do you need to analyze the data? Pros: I had a big data set I should analyze and didn't have any clue about data mining that's where I was introduced with rapid miner and I analyzed my data in less than a day. so I can just say its so easy and pretty simple and perfect. Cons: I couldn't find any instructions and manual as a guideline for using it. Cons: Graphic plotting capabilities compare to R is low, I think this important feature that make RapidMiner stronger. 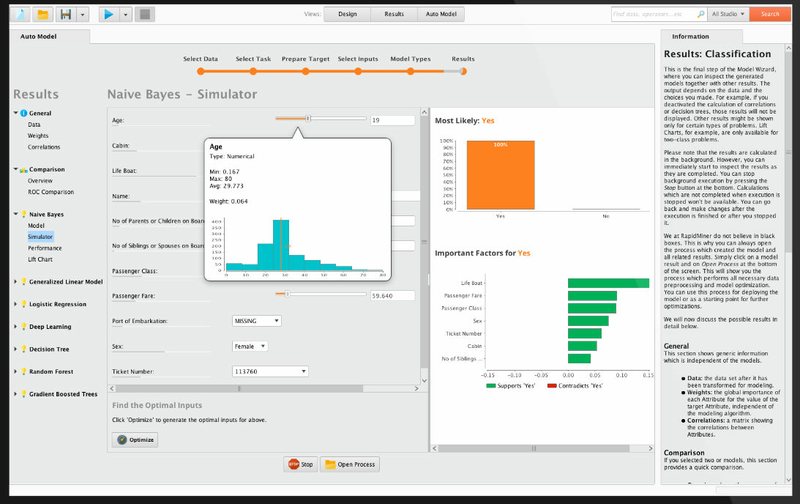 Overall: I use RapidMiner for data analytics, data mining, classification and clustering in construction management. Pros: I learnt how to do data mining with this software. I can only say it is perfect even for new learners. When I started data mining the concept itself was new to me and I did not want to do complicated programming to do my data mining. That is why I chose RapidMiner. It is so easy to use and it provides lots of hint how to use each icon. I really prefer RapidMiner if I want to get my data mined faster and easier. Highly recommended. Cons: The help section was not %100 complete. It has many explanation but examples are not good explained. Great tool for data analytics! Pros: No coding skills needed! 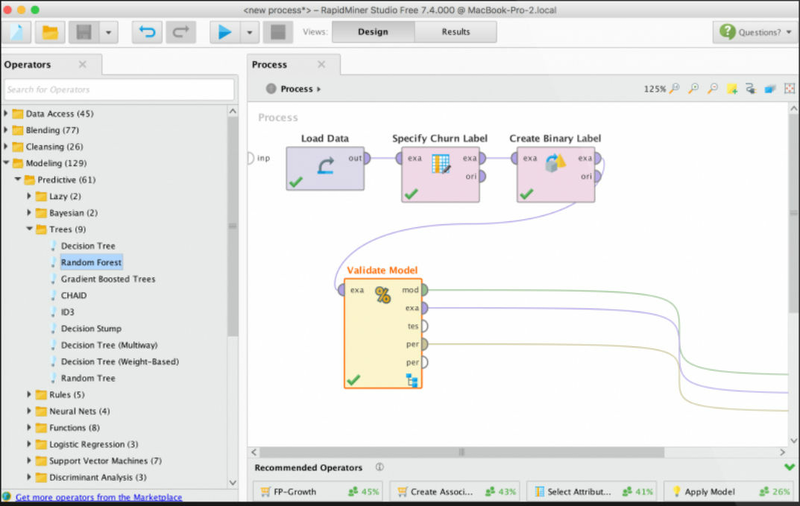 Rapidminer is a GUI tool that you can connect boxes on a canvas to conduct data anlysis, this serves as a great introduction to data analytics. Free for students! You can get a provisional liscence with a dot edu account. This is a great perk of the software. Data analytics and data visualization tools are available within the software with a plethora of other features! Cons: Very buggy! The software tends to crash often, this is especially more common with things such as neural networks etc. Limitations of some versions! Even with the student version there is a limit of 10,000 rows of output, so if you are trying to do analysis on a 12,000 point data set , 2000 points will randomly be omitted. Overall: Great data analytic and visualization tool! Its simplicity enables one to do data science and the best part is you can customize as per need. Rapid Miner is a fantastic tool for machine learning! Pros: It's so intuitive and easy to use. You can have a machine learning model built in just minutes and the price is great too! The best thing is that I don't have to be an experienced Data Scientist to work with this too. It's a great tool at a great price and very easy to use compared to other tools on the market! Pros: Provides a surprising array of different analytical templates from to off. Very easy to get up and running, an online tutorial videos quickly show how to use the different analytical reports. Cons: I always prefer free versions of software to be open source, but that's perhaps being too picky. Overall: I'm using the basic version but was surprised to be able to easily analyse my small data set and identify a few interesting trends very swiftly.